In June last year, at the end of my Giro d’Italia 2015, I rode an entirely ‘Swiss Stage’ including the Gotthard (Tremola road), the Furka and the Grimsel. You can read a report on that stage here – it offered some of the most stunning views I have encountered so far and I am determined to get back there for more, during a longer stay. The Grimsel pass (2,165 m, summit sign 2,164 m) connects the cantons of Valais to the south and Bern to the north; it crosses the continental divide between the Mediterranean Sea and the North Sea. It ‘meets’ the Furka pass at Gletsch and is part of the most famous routes – or round trips – of the Alps. It can be combined with the Furka and Susten passes (north loop), or the Nufenen, Gotthard and Furka passes (south loop). More info on the various loops on the pages of the Alpenbrevet. 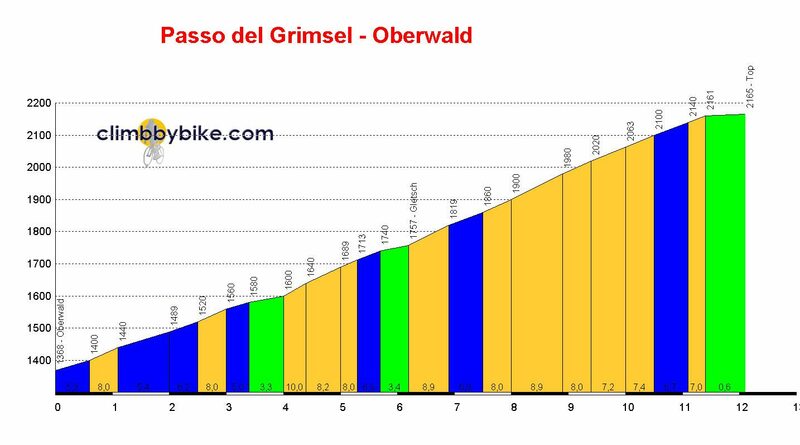 I cycled the Grimsel from Oberwald as part of the ‘Swiss Stage’ at the end of my Giro d’Italia 2015 – report here, pictures here (Google+). I deliberately descended to Oberwald to be able to take on the ‘full’ length of the Grimsel. 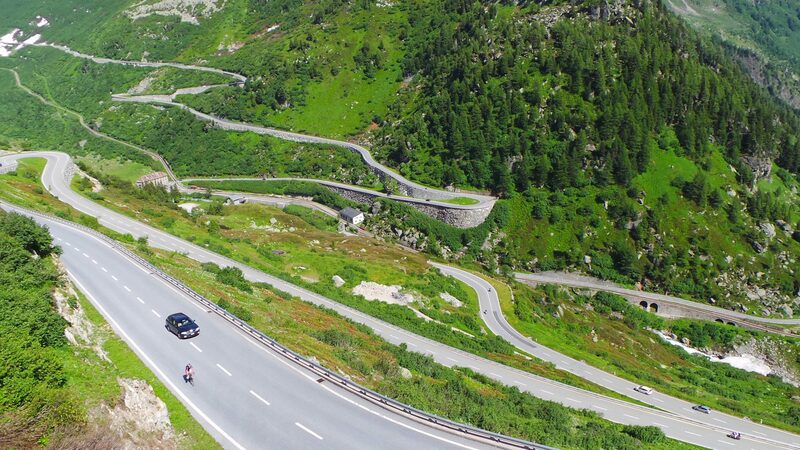 It has the first 6+ kilometers – until Gletsch – in common with the Furka pass. If you come down from the Furka, the ‘natural’ route would be to turn (right) in Gletsch. Leaving Oberwald, you’ll ‘pull’ yourself out of the bottom of the valley through a tree covered area over a distance of about 4 kilometers (average around 7%). Once you pass a short tunnel, the view opens up and you’ll see the Grimsel switching left to right in front and above you. Some 1.5 kilometers further, you might be lucky enough to see the train go through the spiral tunnel, before you take on the final stretch to Gletsch. By the time you’ve reached Gletsch, you have climbed 389 meters, averaging 6.3% over the 6.2 kilometers – the extra distance from Oberwald to Gletsch is certainly not a freebie. The ascend of the Grimsel Pass from the north (officially) starts in Meiringen (595 m), but up to Innertkirchen, the elevation is negligible (30 m). In Innertkirchen, the road to the Susten Pass goes to the left, but the Grimsel continues towards Guttannen, located at 1,057 meters. Beyond Guttannen, the road passes a pair of short tunnels to Handegg (1,378 m) – if you’re interested, this is where the lower station of the Gelmerbahn funicular, the steepest in Switzerland, is located. Past Handegg, you’ll go through a series of hairpins and a long tunnel (850 m long, which at 8, 9% will take you a while to pass, but it’s well lit) to the Räterichsbodensee reservoir. Less than 2 km further on, you’ll reach the Grimselsee reservoir and the Grimsel Hospice (altitude 1,980 m). As mentioned above, there is, among other things, a restaurant at the summit. Earlier this year, when we decided that a “Tour de Suisse” was not going to happen, I did plan on climbing some of the great passes there on our way home. As it was going to be a one day event, I had to limit the amount of climbs. The weather looked fine for the Friday, but we needed to transfer to Airolo first, a 3.5 hour trip. We got up shortly after 5 am and took off around 7 – as usual, the trip took “a little” longer, mainly because of traffic.